Peak Ski Racing Academy will take athletes to Think Head First for base line neurocognitive testing with Melinda Roalstad. 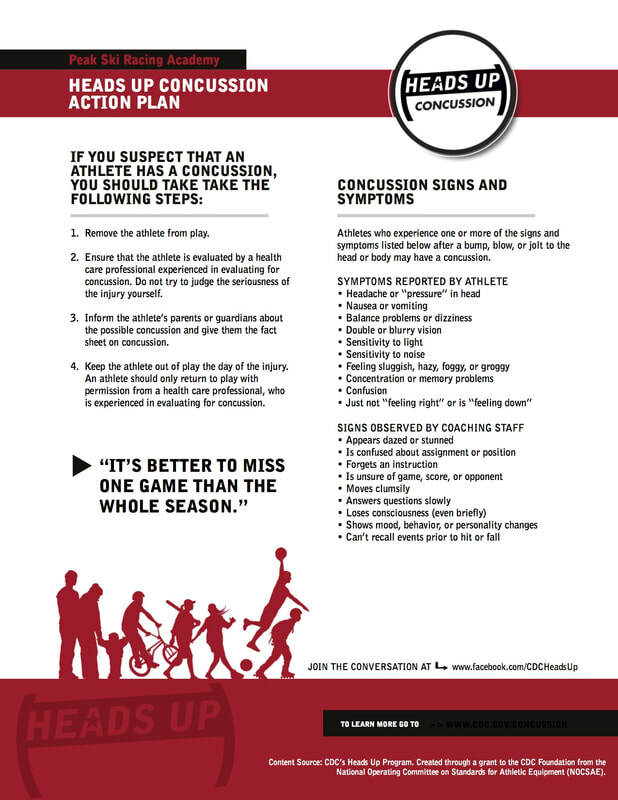 The baseline information will provide invaluable information regarding appropriate management should your athlete sustain a concussion. About Melinda Roalstad, MS, PACMelinda is the former Medical Director for US Ski & Snowboard Association. Melinda implemented the ImPACT testing program and clinically assessed elite and Olympic level athletes from 2003-2007. Additionally, and probably most importantly, she established FIS guidelines for concussion management. Melinda is clinically certified in ImPACT assessments. Any Peak athlete under the age of 18 years suspected of having sustained a concussion/ traumatic brain injury must be removed immediately from participation in Peak sporting event (e.g. sanctioned training, practice, camps, competitions or tryouts), by the Peak Director or coach overseeing such sporting event. The minor athlete will be prohibited from further participation until evaluated and cleared in writing to resume participation in Peak sporting events by a qualified health care provider trained in the evaluation and management of concussive head injuries. The health care professional must certify to Peak in the clearance letter that he/she has successfully completed a continuing education course in the evaluation and management of concussive head injuries within three years of the day on which the written statement is made. Athletes who have subsequently been medically cleared to resume participation must also provide such medical clearance (as described above) to USSA Competition Services in order to be permitted to participate in USSA sporting events. About Concussion A concussion is a type of traumatic brain injury (TBI) caused by a bump, blow, or jolt to the head. Concussions can also occur from a fall or a blow to the body that causes the head and brain to move quickly back and forth. Doctors may describe a concussion as a “mild” brain injury because concussions are usually not life-threatening. Even so, their effects can be serious.